I had no intentions on spending my in-between class break to start choosing things for the cold weather when I return to Kentucky in roughly two weeks, but look what happened. As made blatantly obvious solely by the title of this blog, I have a very "preppy" style which stays pretty consistent. I just figured I would post a few things I found today just to give an idea of things I'll be posting. Note: I do not, at this point in time, intend on posting any ideas I pull from the likes of YSL, D&G or D-Squared. This blog is about things (typically RL or J. Crew, or anything else classic) I want to own, am going to or already do own. 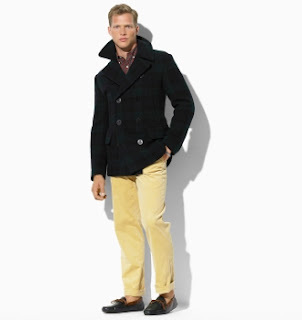 First on the list for Christmas break is this peacoat from the Ralph Lauren Holiday collection. But let's be real, I'd take it all.